Couch #9 belongs to Genevieve. When she moved into her place, she had a bed, chair, desk, and a computer, a stereo and a bunch of CDs. 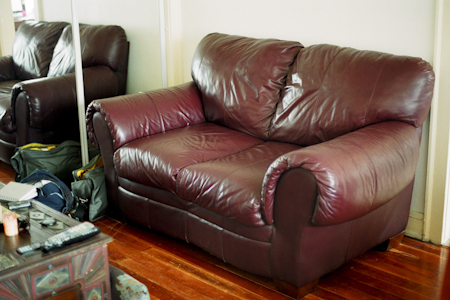 Genevieve knew she wanted a leather couch and found it on craigslist for $150. She is very happy with her purchase. She isn’t very tall, and so it’s comfortable for her to sleep on. Genevieve lives in a studio in an apartment building on the border of Koreatown. She is an actor and pick whatever other work comes her way. She has a 17 year old son who lives in Florida with her Mom, who is his legal guardian. She likes to read, write, fool around with her guitar, practice her piano, hang out with friends, go out drinking and get rowdy, go hiking and is working on singing too. She talks to herself and has conversations, although she thinks of it more as talking to God and the Universe to help her work things out. We are acquaintances and met on the set of “American Bar”. Our friends wrote it and I was the photographer. That was in 2007. One of her favorite songs is “Breathless” by Nick Cave, although she also likes Cat Power’s version even though it has the opposite feel. She likes the film “Goodfellas” and enjoys any food with pumpkin. Genevieve thinks the whole project is pretty cool and she wanted to be a part of it. She wanted to open her doors and share her space with me. She feels as if I am performing for 50 days. That I always have to be on. That I am putting myself outside of my comfort zone. She believe that change is always good. She is right on all counts.